Note: For this recipe, it is much easier and faster if you have a food processor with a thin slicing blade or a mandolin. Preheat oven to 350°. Slice potatoes lengthwise very thin (about 1/16 inch). Brush 2 baking sheets with 1/2 Tbsp. olive oil each. Rub garlic over surface, pressing hard to extract as much garlic juice as possible. Place baking sheets in oven to warm for 5 minutes. 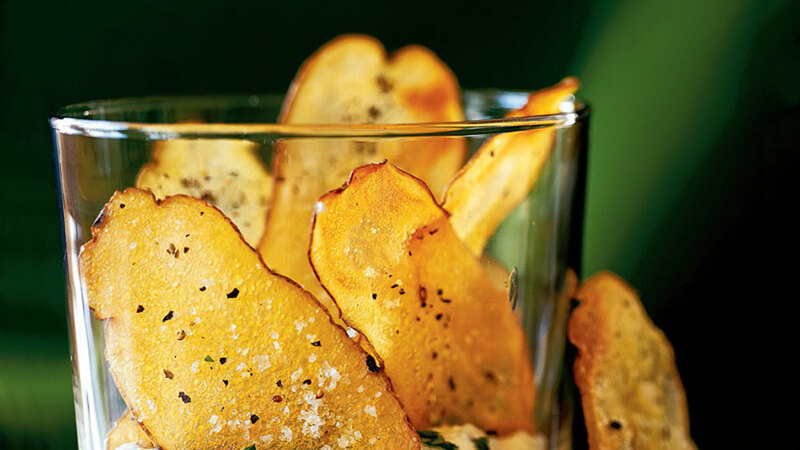 Place potato slices side by side on hot baking sheets. Sprinkle generously with salt and pepper. Bake 7 to 10 minutes, rotate pans (for even browning), and bake another 10 to 15 minutes. Flip potatoes and bake 5 minutes longer or until golden. Remove and cool on paper towels. Repeat with remaining potato slices. Eat warm or store in airtight container.